​Grelen now has FIVE miles of trails to discover! Whether you're looking for a full day excursion, or a light stroll after lunch, we highly recommend you save time for a hike. There are options for all ages and skills...take a walk up to a beautiful vista overlooking The Nursery or go for a long run/hike through the nursery, meadows & forest over to James Madison's Montpelier Trail System. With Montpelier's trails, there are over 10+ miles of beautiful trails to explore. The Grelen walking Trails are FREE & open to the public. There are picnic tables at the top of Outlook Trail and Bloomfield Loop as well as by the pond. A Market at Grelen lunch can be ordered "to go" from the café. Please call or email at least 24 hours in advance to pre-order. Due to crowds, we cannot take same day pre-orders on weekends and picnics will be prepared and ready at 11 a.m. on wkends. No outside food permitted. Walkers & Hikers must be off the Grelen Trails System by 4 pm. Please be respectful of our employees and return to your cars on time so they can close the shop and lock the gate. Since we are not publicly funded, food and drink sales help us offset the expenses of creating and maintaining the trail system. 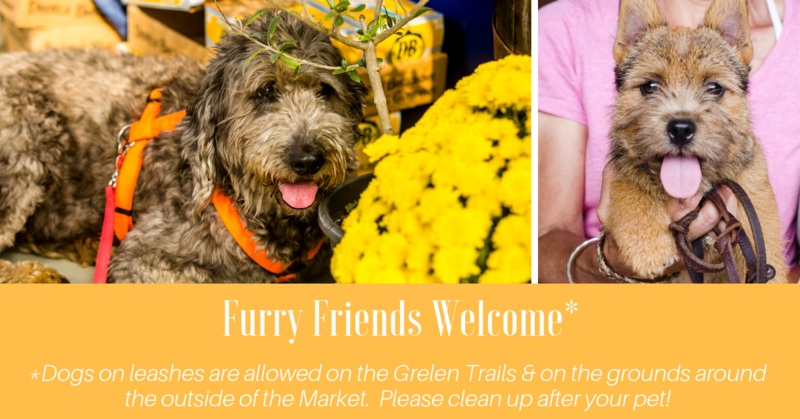 We appreciate your support of The Market at Grelen shop & cafe! ​No private bikes or horses allowed. Since we are a tree nursery, there are too many large holes in the tree rows that pose a risk to horses and bikers. ​The Market at Grelen invites you to participate in its third hiking event to benefit Warrior Expeditions, a non-profit organization helping veterans have a smooth transition from military service back into civilian life. Join as an individual or create a team and ask other friends and co-workers to join you. You can also earn extra $ for the cause by asking others to sponsor you. Hike the beautiful Grelen Trails for as many miles as you can handle. Pick up tokens along the way and turn them in at the end for a chance to win prizes. The more you hike, the more raffle tickets you can gather and the better your chances of winning. in the Orchard Overlook tent. On April 19, 2016, the connector trail linking Grelen to James Madison's Montpelier was officially designated as a “Virginia Treasure” by the Office of the Governor for being an outstanding recreational asset open to the public in the Commonwealth. Virginia First Lady, Dorothy McAuliffe, and Department of Natural Resources Secretary, Molly Ward, presented the award and then walked the trail with representatives from Grelen, Montpelier & PEC. The Virginia Treasures initiative focuses on quality rather than just quantity. The program stresses safeguarding significant sites and assets rather than just the numbers. The idea is to preserve, protect and highlight Virginia’s most important ecological, cultural, scenic and recreational assets as well as its special lands. Co-owners Dan & Leslie Gregg and Zeke Galvin are honored and humbled by this designation and will continue to support the efforts of Orange County, the State of Virginia and PEC to celebrate and preserve land. along Grelen's trails by scanning the plant barcodes with a QR code scanner. It's free, and a fun way to interact while on the trail! We'd like to thank our community partners ﻿PEC﻿ and James Madison's Montpelier who have helped to make this dream a reality. It truly takes a village, and we feel so lucky to have such wonderful neighbors!